Production for the next project is under way, and I'm proud to announce DZ17 will be the new Hemlines EP. 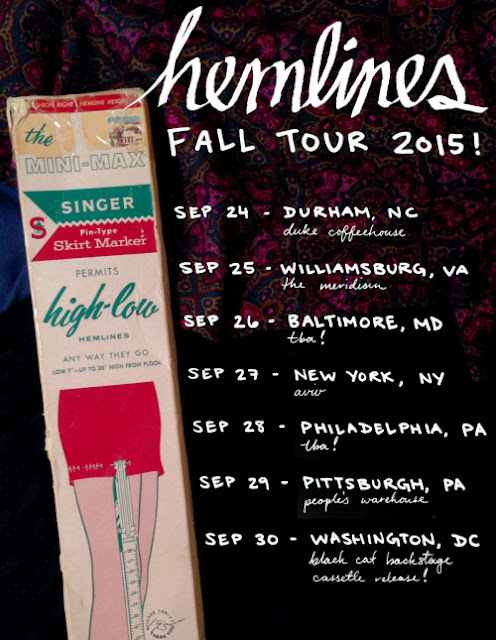 The four-piece feminist punks are taking their show on the road for the first time and the tour will be bringing them around the mid-Atlantic and East Coast, starting down south in North Carolina, going up to New York, then back to the District on September 30 for the official cassette release show at the Black Cat with Homosuperior. 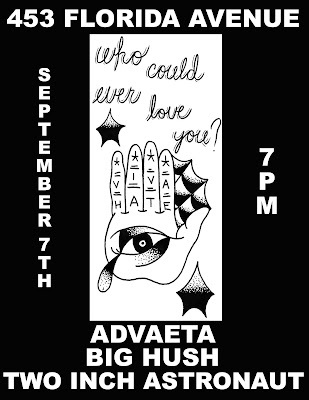 Two of my favorite bands from anywhere are playing on tonight at 453 Florida as Big Hush and Two Inch Astronaut play host to New Yorkers ADVAETA (click flyer for details). Then on Sunday September 13, the sixth installment of the Escape From DC Brunch series at (my new abode) Hole In The Sky showcases some groovy out-of-town talent with Mild High Club and Laser Background, featuring local support from BRNDA (click flyer for details). With In It Together Fest 2 in the rearview mirror, I'm proud to announce we raised over $7000 for DC Abortion Fund, Collective Action For Safe Spaces, and We Are Family DC.